View the entire table of contents for the June 15, 2014 issue. Helen Keplinger makes a total of 1,200 cases a year under her Keplinger label, working with her husband, DJ Warner, in rented winery space in the Carneros district of Napa Valley. With a string of 22 outstanding wines since 2006, she's is one of the most exciting and innovative wineries to emerge in California in years. In embracing a handful of Rhône Valley grapes, especially Grenache, Keplinger has created captivating and uniquely styled wines that are stretching the boundaries of what has been a Syrah-centric arena among California vintners. Wine Spectator's James Laube explains. 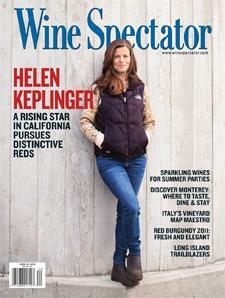 For the full article, check out the new issue of Wine Spectator, on newsstands May 20, 2014.